The American Adventure plays host to the rest of the countries in World Showcase. The pavilion is actually 5-stories tall, yet with the help of Disney’s force perspective it looks more like two stories. Step through those 10-feet tall entry doors into the grand rotunda. As you walk on the marble floor with inlaid copper your eye will be drawn to the large Corinthian-style columns before landing on the artwork and quotes as well as cases of memorabilia related to the colonial period of America. The paintings show strategic points in the history of the United States. There are beautifully carved wooden Eagles on the wall and upstairs you will see exquisite period furniture pieces. The Georgian Colonial architecture presents a strong and welcoming structure. Come on in! If you visit during the International Food & Wine Festival, and you have a CHASE Disney Visa Card you can take the elevator or the stairs up to the “Chase Lounge” and see more of the interior. When making your way to the theater upstairs you will pass through the Hall of Flags where 44 different US flags hang. There is one of each flag that the United States has flown. Disney Imagineers wanted the glory of the red, white and blue reflected throughout the American pavilion. Take notice of the trio of colors in the landscaping with flowers, and even the building made of Georgia red clay bricks, white trim and the large blue fountains aid in repeating the patriotic colors. Walking into the theater for The American Adventure will cause any patriot’s heart to swell. On the sides you will see the Spirits of America carved marble statues. The statues are in tribute to: Adventure, Compassion, Discovery, Freedom, Heritage, Independence, Individualism, Innovation, Knowledge, Pioneering, Self-Reliance, and Tomorrow. You will be invited to take one of the 1024-comfortable seats. Even in here you will find the red, white and blue well represented. The show incorporates dramatic scenes telling America’s story. The Imagineers brought us Thomas Jefferson, Benjamin Franklin and Mark Twain via audio animatronic figures. The show opens as we are ushered into the room where Thomas Jefferson is writing the Declaration of Independence. Benjamin Franklin is seen climbing the stairs, then crossing the room to stand by the writer. This is an amazing feat. Once the story reaches the time period of the camera, the Imagineers felt it was proper to continue through film to tell more of the history. In fact, the screen itself is pretty impressive as it is the largest rear-projection screen in existence. The 30-minute show is shown repeatedly throughout the day. Yo will be humming the theme song, “Golden Dreams” as you walk out of the theater. 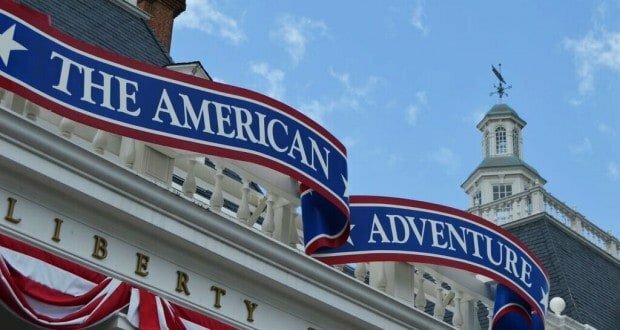 The American Adventure is the only country that does not contain a Table Service restaurant, but good casual dining can still be had here. There is always plenty of seating here, both inside and out, providing more casual seating than any other country along the World Showcase Promenade. The menu includes some good New York Strip Steaks, Angus Burgers, Southwest Chicken Salad, Chili-Cheese Dogs, Smoky BBQ Pork Sandwiches, Macaroni & Cheese, Pasta, and Chicken Nuggets. The Fife & Drum kiosk out front sells the wildly popular Jumbo Turkey Legs along with some other light snacks and cold beverages that may be enjoyed sitting in the American Adventure area or as you continue to walk around World Showcase. Near the side that joins with Morocco you can find a small but very productive Funnel Cake stand. Who can resist that? The Hops and Barley stand always has a large selection of craft beers and light snacks. During the Festivals visit the food kiosks here for delicious American fare and brews! This 900-seat beautiful outdoor venue plays an important role at Epcot. It serves as the host for Holiday celebrations and is the centerpiece of entertainment for the International Flower and Garden Show as it hosts Flower Power Concerts, during the International Food & Wine Festival guests enjoy more singers in the Eat to the Beat concerts. Disney’s Voice of Liberty a Capella singers fill the theater and the rotunda with inspiring music. They are not to be missed, so check your Times Guide for their show times. The Candlelight Processional during the Holiday season is perhaps the most moving Holiday experience at Walt Disney World with music of the season and celebrities who read the Biblical account of the Christmas story. Many families make this a part of their Holiday tradition every year. The music is performed by the Walt Disney World Orchestra and a large choir made up of WDW Cast Members who audition each year for the opportunity to be a part of this annual event. The gift shop sits to the right side of the pavilion, next to the Kidcot station. They always have wonderful food items, drink options, USA-themed merchandise, jewelry, apparel, games, books, most provided by small businesses and farms in the United States. This pavilion is so large that it often has additional kiosks open with handcrafted items including collectible porcelain dolls and personalized Christmas ornaments. Meet Santa and Mrs. Claus and get your photo taken with them next to the Kidcot station, to the right side of the pavilion under the Portico. They appear on a time schedule throughout the day. The Voices of Liberty Dickens’ Carolers appear during the Holidays singing traditional colonial carols in the Dickens’ costumes for a real old fashioned Christmas delight. We know the Holiday season is celebrated in different ways such as Christmas, but also Hanukkah traditions and Kwanzaa customs are presented here. Make sure you visit each Holidays Around the World performances. Grab a treat from the Santa’s Village Bake Shop to enjoy while taking in all of the Holiday lights, decorations, and sounds.